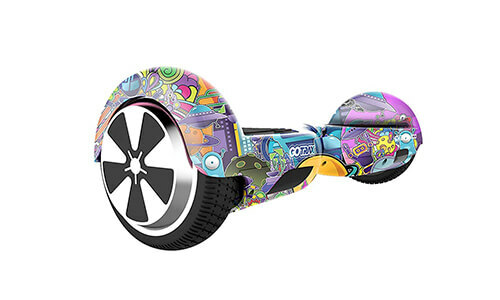 Hoverboards are now much more than the cheap fad that swept the nation back in 2014 and 2015. They have developed to become a genuine form of personal transportation that can provide a quick, cheap and easy last mile commute or even help with simple trips up town. But most of all they’re a lot of fun! With the continual progress made in this field of transportation there have been a range of new developments. 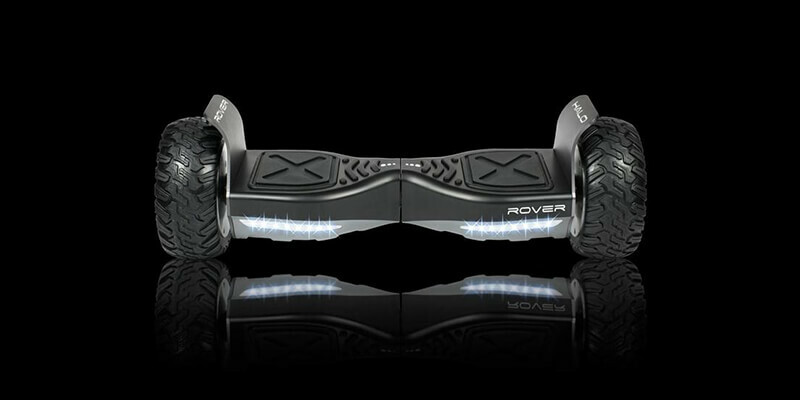 One of those is the creation of a range of high quality off road hoverboards (sometimes referred to as off road self balancing scooters). These are hoverboards that can comfortably ride of all types of terrain and make the commute through a park or down a dirt track just as easy as riding on tarmac. 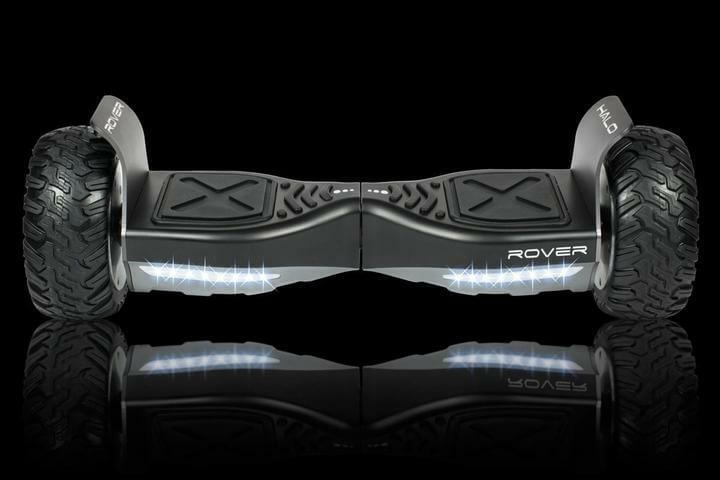 In this article we’ll take a look at some of the best off road hoverboards currently available. We’ve tried, tested and researched a range of hoverboards that are said to be “all-terrain” and “offroad” and have reduced them down into a list of the 5 best off road hoverboards we could find. 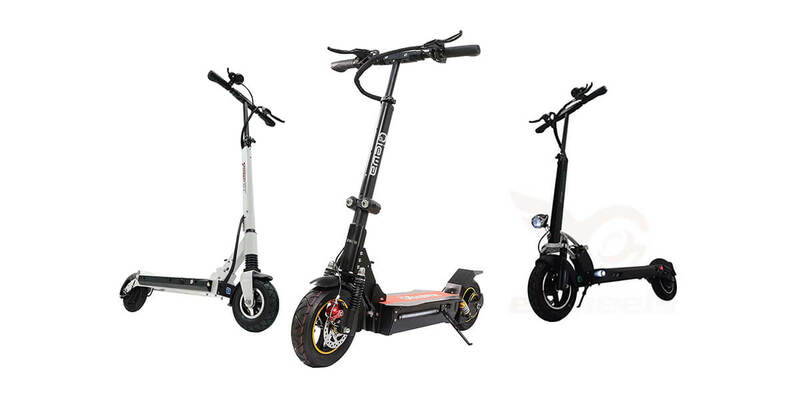 We’ve reviewed a lot of Swagtron products on AltRiders and they all follow a very similar theme. They are packed full of features and generally are very reasonably priced. The Swagtron T6 is another perfect example of this. 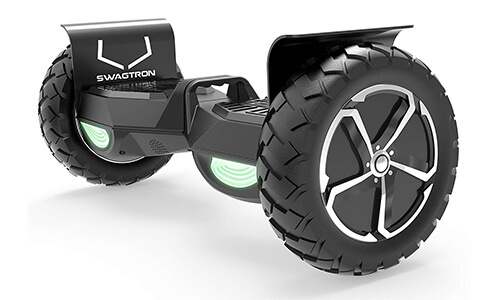 By looking at the Swagtron T6 you’ll immediately tell that it’s made for all terrains. It has big chunky 10 inch tires and a solid looking frame with included mud guards over the wheels. It can easily handle grass, mud and even gravel. The entire thing is IPX4 rated which means that it is water resistant and can handle being ridden through puddles of water and in the rain. It’s also able to handle riders of 250lbs and is UL 2272 certified. The Swagtron T6 also has good performance to back up the rugged exterior. 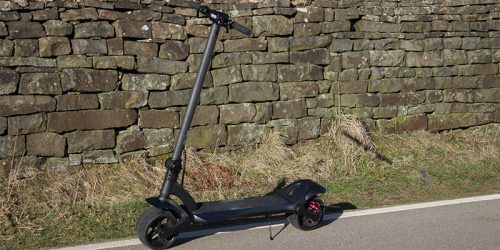 It has a range of up to 12 miles on a single charge and can even reach speeds of 12 mph. Its charging time is about 2-3 hours from flat. These are good stats for any hoverboard but are even better when you consider that this hoverboard can manage those performance figures when doing it all off road. Like many Swagtron products it also has a few additional features that not many other products at similar price points offer. In this case the T6 has built in Bluetooth speakers, a battery indicator as well as turning signals and LED lights directly embedded into the body, so all it takes is one look to check on your T6’s status. 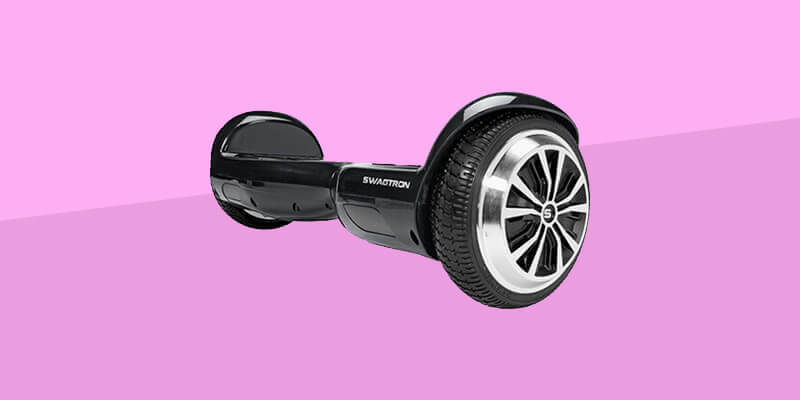 Overall, the Swagtron T6 is a great hoverboard and performs very well in most conditions. The problems we’ve seen with it are that it doesn’t quite have the power and traction to make it a proper off road hoverboard. It performs much better on flat, smooth surfaces than it does on grass or mud. So as long as the off roading is fairly tame you will be fine. Despite this, the price, performance and features make this one of the most attractive off road hoverboards around. The Epikgo hoverboard comes straight from the heart of Silicon Valley. It has been designed and built to be one of the best hoverboards money can buy, but even comes at a reasonable price. One of the major problems with a lot of hoverboards is that they simply lack the power and traction to work well off road. This solves that problem very well. It has two 400W motors that can help it climb 18 degree hills and work just as easily in long grass, mud, gravel and even sand. The Epikgo also will charge from flat in less than 2 hours and will last around 10 miles on a single charge. It’s mainly built from an aluminum alloy body that’s strong and durable. 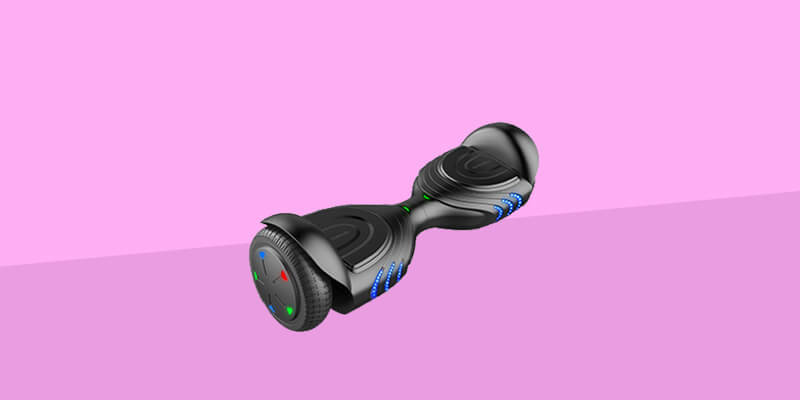 It’s also quite large, about 30% the size of most hoverboards which helps it accomodate more sizes of people and will generally give you more control. This does, however, increase the weight a fair bit to a weight of 31 lbs. But it’s solid and well constructed, the tires are some of the best we’ve tried and the whole hoverboard works exactly as advertised. 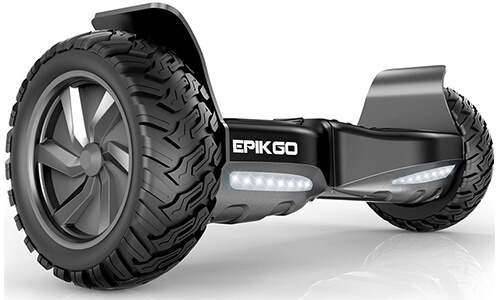 The maximum rider weight of the Epikgo is 265 lbs. It’s also IP56 waterproof certified and has passed all 159 test to allow it to be UL2272 certified. Overall, the Epikgo doesn’t stuff the hoverboard with gimmicks and useless features, it focuses on all the basics and does them all very well! 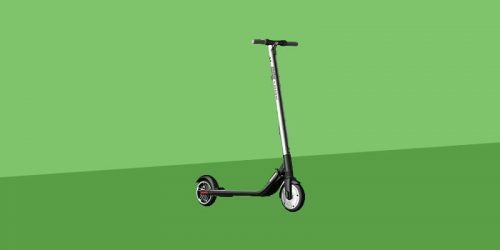 If you’re looking for a self balancing scooter that is simple to ride and works well on almost any terrain, then this is one of the best off road hoverboards you can buy. If you’d like to read a more in-depth review of the Epikgo we’ve done a full review. We’re a big fan of Halo Board products here at AltRiders and many of them are rated very highly on our sidebar list. The Halo Rover is one of the absolute best. It’s similar to the Epikgo in the fact that it does the basics very well and doesn’t overwhelm the user with features that aren’t necessary. That’s not to say that there is a lack of features though. The Halo Rover is packed full of features, many of which greatly improve the riding experience. For example, one of the most eye-catching features of the Halo Rover is the accompanying mobile app. These types of apps can be very hit and miss but we think Halo Board have done a great job with this one. The Halo Rover Mobile App is available on Android and IOS and will track your speed, battery life, distance, map your ride, and power on and off your Halo Rover! It also gives you access to the different riding modes. The Halo Rover has 3 riding modes – Beginner, Intermediate, Advanced. These modes provide increasing levels of speed for the rider, so that they can progress safely on their hoverboard. You can switch between these modes by using the app or manually, using the ‘on’ button. The performance from the Halo Rover is also very good. The battery is an LG Lithium Ion battery, and has a minimum of a 4 year life span. This battery can give a max range of around 10 miles, or 2 hours of travelling time, and can be fully recharged in only 2.5 hours. The top speed of the Halo Rover is 10 mph by using dual motors of a total of 800W to power the board. This power will greatly help with off road riding and when working with the quality wheels and tires you’ll be able to conquer almost every terrain. The tires are 8.5 inch ‘indestructible’ never-flat tires, which means they’ll continue to work even with air loss if it is punctured. They have solid grip on them and feel very sturdy, so much so that you’ll feel completely confident on hills of up to 20 degrees incline. Overall, the Halo Rover is one of the best hoverboard on the market right now, not just off road hoverboards. It performs well, has a great range of features and is very well made. The only downside is that it is quite expensive. For a more in depth look, check out our full Halo Rover review. The CHO All Terrain Hoverboard is a budget hoverboard that is packed full of features and works fairly well off road. The board itself is well built but isn’t amazing. It’s fully compliant with all the standard safety certificates such as the UL 2272. But it does lack the solid build quality of the Epikgo or the Halo Rover. One of the best parts of the build is the 8.5 inch solid rubber tires that help provide a decent level of traction and will make off road riding much easier. 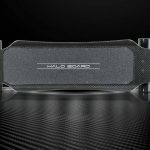 One of the standout points of the build quality and structure of the board is that it can hold a maximum rider weight of 264 lbs. The performance is quite good compared to the price of the hoverboard. It can manage a top speed of 8.5 mph and can travel to a max range of around 12-13 miles. It can also fully recharge in just 90 – 120 minutes, using the included charger. It can handle a range of different surfaces and terrains, not quite as well as the Epikgo or Halo Rover but for the price you’re paying it does a great job. The CHO hoverboard comes with a lot of features as standard. 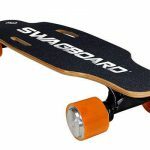 It has LED headlights and turning signals, a built in set of Bluetooth speakers and even comes with a carrying case that’s perfect for transporting the board around when you can’t ride it. Overall, the CHO all terrain hoverboard is a great budget buy. It works well on all terrains, has some good performance statistics and has a good range of features. All of this for a very reasonable price. In the same vein as the CHO all terrain hoverboard is the GOTRAX Hoverfly XL. 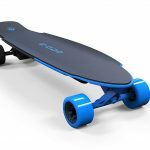 This is another budget hoverboard that aims to make a good all terrain hoverboard available for more people. The Hoverfly is well built and well designed. 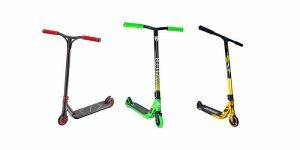 It comes in 7 colors and styles to choose from and is made mostly from high strength plastics and rubber allowing a max rider weight of over 220lbs. The entire board is safety conscious and is fully UL 2272 certified. The Hoverfly uses 8 inch rugged rubber tires that are perfect for riding on flat surfaces. It works ok on grass, dirt and mud etc but isn’t the best on the list when taking it off road. It is however still much better than most hoverboards. We think the tires could be a little chunkier to give more grip and the motors a little bigger to give more power. 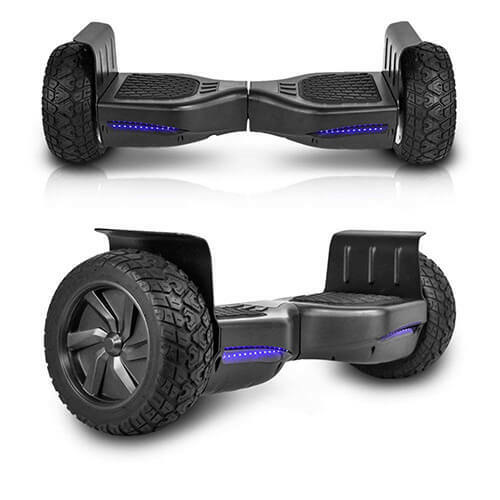 Speaking of power, this hoverboard is powered by two 350W motors to give a total of 700W. This gives you a top speed of 7.4 mph. The battery life is quite good, giving a general range of around 10 – 12 miles on a single charge. The GOTRAX Hoverfly focuses mostly on the performance and riding comfort. It has specialised non slip foot pads, LED lights and nice big bumpers to make riding the Hoverfly as simple, easy and safe as possible. Overall, if you’re looking for a simple, well designed hoverboard that’s good value for money then this is a great option. Don’t expect any fancy Bluetooth speakers or anything like that. The Hoverfly’s focus is more on the riding experience and performance rather than additional features. The wide range of colors are also a great selling point and we think this would be perfect for someone with kids who doesn’t live in the city or even a town. If you’re interested in a slightly less off road version, we’ve reviewed the GoTrax Hoverfly Eco which could be just what you’re looking for. 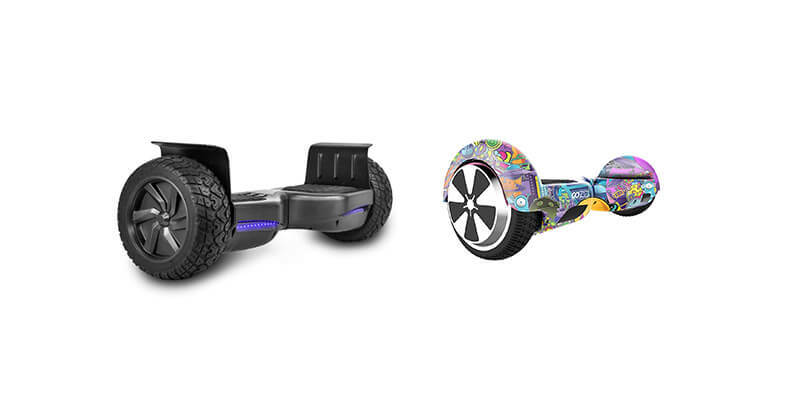 We hope this has helped you decide which off road hoverboard is best for you. Our pick would be either the Epikgo or the Halo Rover as both of those boards keep things simple whilst providing a great experience and performance. First of all, thanks for this great article. 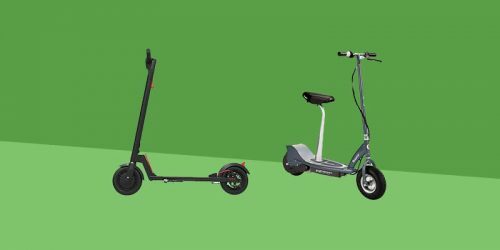 I am 90 kg adult and after reading these reviews, I have decided to pick the Gotrax hoverfly eco hoverboard from your list. I just wanna ask, will it support my weight? and what do you think about my choice? Hi John, the specified maximum weight is about 100kg, so you should be fine!